the paper dialogues: dessert first, please! How typical of me to have gotten obsessed with dessert ideas for my wedding already. 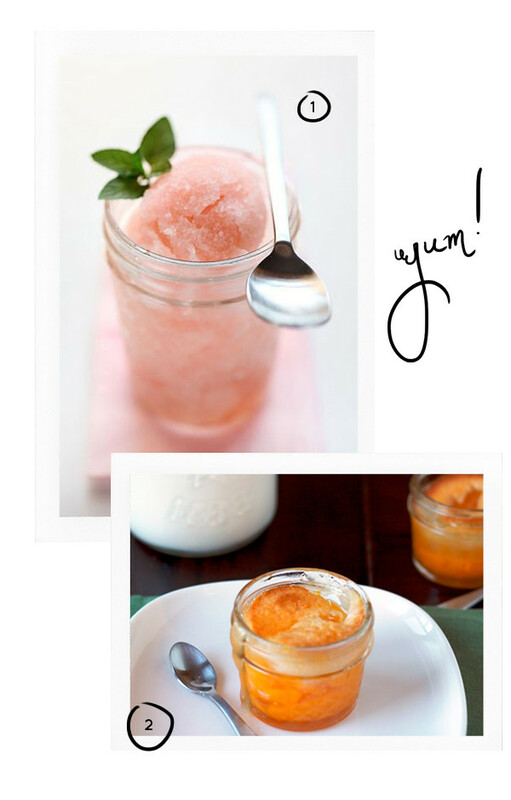 One trend that has won me over: dessert in jars! How cute would it be to have tiny jars of desserts with adorably tiny spoons to match? Think about it! Pies...ice cream sundaes...cake... italian ice! Is it crazy for me to think I can do this on top of making my own bouquet and decorations? these would be easy to transport in a box without worrying about a mess of epic sized proportions to follow. i'm sure the moisture and humidity inside a closed jar would make the cake even more rich and tasty. don't quote me on that. 2. portion control: you could definitely make individual sized portions for people to enjoy, or even use larger jars to share family-style! 3. the container: who doesn't love mason jars to keep afterwards! I'd have to buy hundreds of jars.... maybe I could just have them for my bridal shower. Heh-heh. 15 dessert recipes in a jar! dinner rolls in a jar! I love this idea! :) it looks so simple and delicate too - perfect for a wedding. every thing tastes better in a jar...even water. PS. congrats on the engagement!!!! loving the jars!! you can ask around from all your friends for their used jars- a friend of mine done this and put tea lights in all of them, jars FTW! !